I recently wrote about the worst pre-order “bonus” I’ve ever seen in the form of Namco Bandai’s Gamestop/EB Games Tales of Zestiria partnership with Prima Strategy. However being the kind of guy who tries to look at the bright side of most things I thought I’d show you the best pre-order bonus I’ve seen in quite some time. 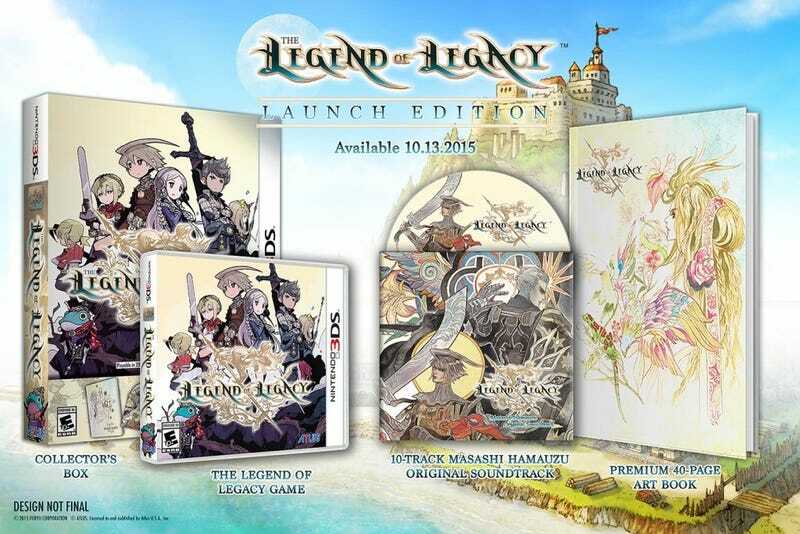 The above picture is the “Day One/Launch Edition” of Atlus’ upcoming 3DS JRPG Legend of Legacy notice this isn’t a collectors edition this is for people who get it day one (or while suplies last). Included are a bonus box (yay...) a Music CD, AND an Art Book. Hell you don’t even need to pre-order as these are all packaged together meaning you can come in while supplies last to buy this. Notice no DLC, no “Strategy Video’s”, instead three pieces of physical assets you can’t buy after the fact when the company wants to extract more money from you. This is the exact same bonus present in Atlus’ other 3DS title Shin Megami Tensei IV. I’ve said it before and I’ll say it again pre-ordering doesn’t need to be a bad thing you just need to give actual value to the consumer. I think Atlus knows this and its why they’re one of the best in the business. I just wish Namco Bandai and others would learn this lesson. Also for those of you who want to check out the game before you buy The Legend of Legacy’s demo is on the Eshop now.